Specially designed for the home user and aiming at giving as much flexibility as possible during the work. It even includes some features never to be found in Photoshop. PicPick, besides being a very easy to use image editor also sports graphic capture options and a set of hotkeys and options some similar editors would envy. This program makes us think of a Swiss Army Knife, or perhaps a well-stocked, well-organized desk drawer. 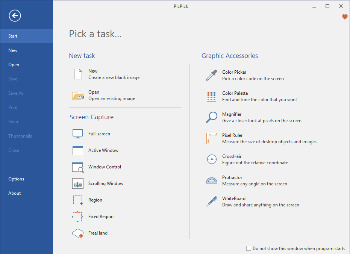 There are all kinds of helpful tools here, and we think PicPick would be useful to Web designers, graphic designers, and even the average computer user who occasionally needs to work with graphics. Take screenshots of an entire screen, an active window, the scrolling windows and any specific region of your desktop, etc. Annotate and highlight your images: text, arrows, shapes and more with the built-in image editor that includes the latest Ribbon style menu. Easily add effects to your images: drop shadows, frames, watermarks, mosaic, motion blur, brightness control and more. Save, share, or send your images via Web, email, ftp, Dropbox, Google Drive, SkyDrive, Box, Evernote, Facebook, Twitter and more. Variety of graphic design accessories including color picker, color palette, pixel ruler, protractor, crosshair, magnifier, whiteboard. With highly advanced settings, you can customize hotkeys, file naming, image quality, and many other options that fits your needs.